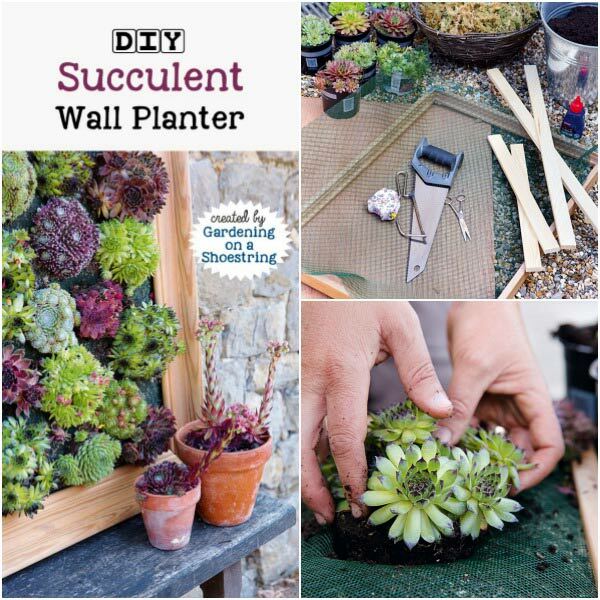 Make this succulent wall planter with these step-by-step instructions. 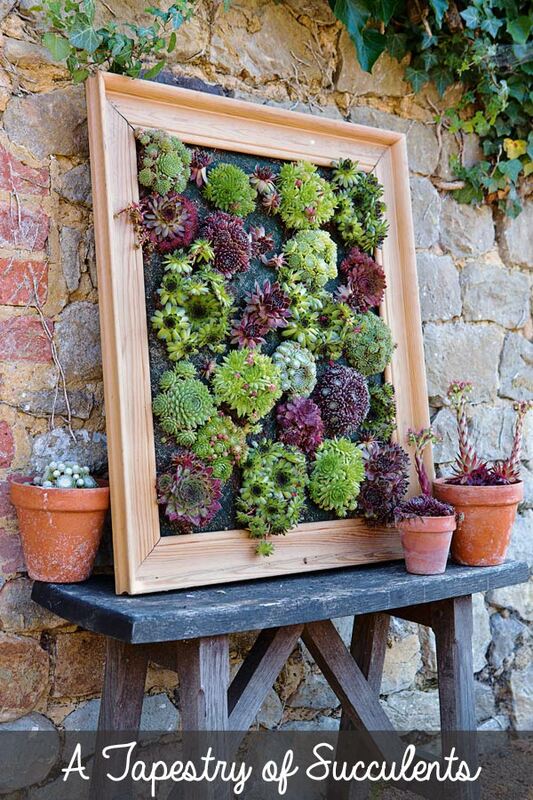 It’s a living wall of succulents in a picture frame! 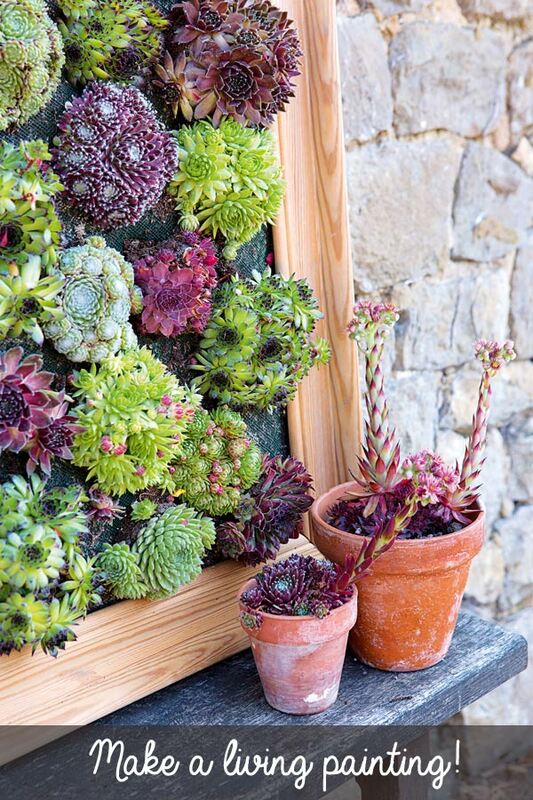 Sempervivums, also known as hens and chicks, are the perfect drought-tolerant choice for this vertical garden project. 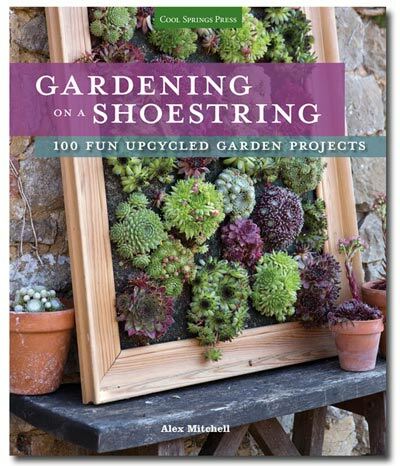 This tutorial is an excerpt from the wonderful new book, Gardening on a Shoestring: 100 Fun Upcycled Garden Projects by Alex Mitchell. 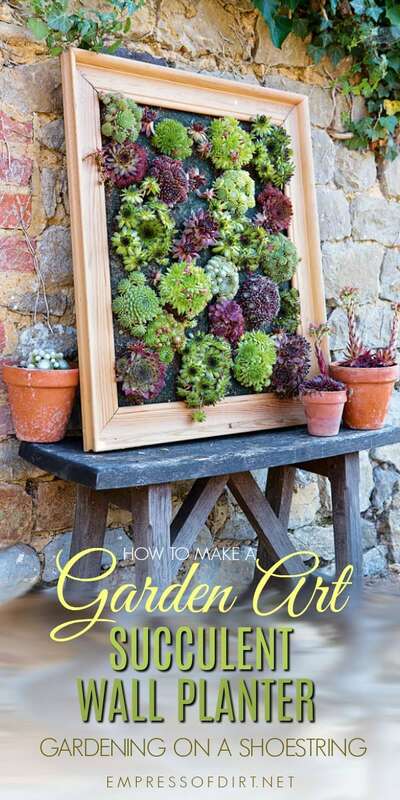 If you love this, you may also enjoy 10 Delightful DIY Succulent Projects. I knew as soon as I started flipping through this book that I would love it. Creative and frugal gardeners of the world unite! Gardening on a Shoestring by Alex Mitchell is filled with ideas for transforming everyday items into unique living art and functional garden essentials with a twist. You know how I wrote about creating my dream garden on a very low budget of just $100 per year? The same idea is at play here. It’s not about being cheap or skimping. It’s about making the most of what you have, repurposing and re-imaginging, letting go of conformity, allowing yourself to play, and coming up with unique and fabulous garden decor. Garden decor that might just be bursting with the delicious colours of dozens of hens and chicks. Sempervivums (hens and chicks) are a perfect choice for this project. They are not only drought-tolerant, but have very shallow roots. Find a sturdy, old picture frame from a yard sale or thrift shop, grab a few supplies, and you’re all set. 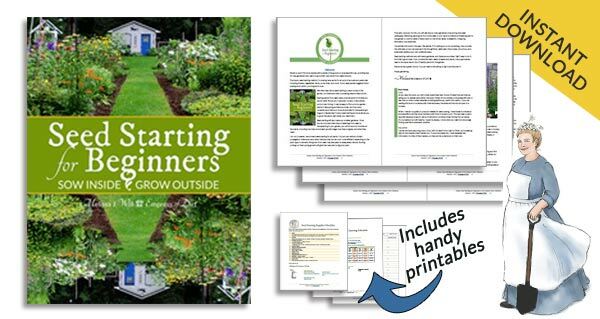 This project is excerpted from Gardening on a Shoestring by permission from the publisher who also provided a copy of this book. 1 picture frame (bear in mind, the bigger the frame, the heavier the finished tapestry will be). Wooden board (any type) to make the frame. The length depends on the size of the frame. For a large frame, choose a board 2 x 1 inches; for a smaller frame, 1 x 1/2 inch. 3 square feet of greenhouse shading material (you can buy this by the foot from a home-improvement store), or, if you can’t find this, use weed barrier or landscape fabric. Watering can with rose attachmentKeep in mind that the larger the frame, the heavier your project will be. Cut your wood into 4 pieces to make a box that fits onto the back of the frame. Glue the greenhouse shading onto the picture frame. Stick the wood on top of the shading material to make a box. Drill drainage holes in the bottom of the frame. Mix moss and soil together and pour into the frame. Cut plywood to fit the back of the frame. With scissors, cut crosses in the shading material. Turn over the picture frame and lay it flat on the ground. With your saw, cut the wood into four pieces that fit along the four sides of the back of the frame to create a box. It makes sense to fit this box to the inner rather than outder edges of the frame to make the finished tapestry less heavy. Lay the narrower edge of the wood on the frame with the deeper edge vertical to give the box more depth for the plants to grow in it. 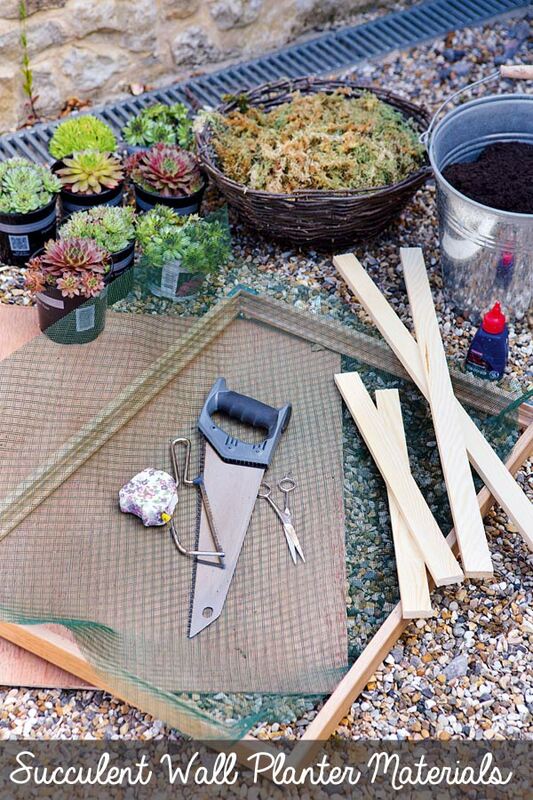 Next, take your piece of greenhouse shading material and lay it on the back of the picture frame. Pull it taut, it doesn’t matter if it overhangs. Apply wood glue all around the edge of the frame onto the shading material and also onto the bottom sides of the four wooden pieces. Stick these pieces down on top of the shading material to create the box and weigh them down with something heavy (bricks, for example) until the surfaces bond securely. Allow to dry thoroughly. Now drill three holes in the bottom edge of the frame, each with a diameter around 1/16 inch. These will act as drainage holes so the compost does not become waterlogged. Mix together the sphagnum moss and soil in equal quantities and then press it into the box. Tuck it into every corner and make sure the whole box is full, otherwise the soil will drop to the bottom when you stand the picture frame upright. Once you are happy that it is filled, cut the piece of plywood to fit the box and glue it onto the wood. If you don’t want to cut the plywood, most big DIY stores offer a cutting service when you buy from them. If you are hanging the picture on the wall, drill a hole in the top of the plywood to hang it from. Weigh down the plywood back with stones, plant pots, or anything heavy to ensure the bond is secure. Once the glue is dry and bonded, fly over the frame; you are not ready to plant. Using scissors, cut crosses in the shading material and push in your plants, aiming for a varied spread of colors and textures. The material will keep the plants and soil from falling out. Try to fill the frame completely, but if you still see some material, don’t worry, the plants will soon grow to hide it. Water the frame from above with a watering can fitted with a rose attachment. Leave the frame lying flat on the ground for a week to let the plants settles and root into the soil, then mount it on a wall or prop it up on a ledge where it can be admired. Every couple of weeks, lay the frame flat and water it. Leave to drain for half an hour or so before hanging it up again. Great idea – but there is one flaw – if you don’t use a waterproof wood glue, the whole thing will fall apart before the first season is over. I would love to win the book Gardening on a Shoestring. That is what I do in my garden. Most of my plants are home grown from seed or traded for at plant swaps. I make a lot of my garden decor. Always looking for new ideas to grow my garden on a shoestring. This is an awesome idea! I am eager to see what other ideas “Gardening on a Shoestring” can give me! Thanks for posting! I would love to win “Gardening on a Shoestring”! I am gathering succulents to build a living wreath, and I plan to start a kalanchoe garden. The more succulents I see the more I want! Gardening on a Shoestring sounds like a fun book, and useful for me. My budget doesn’t extend to the garden this year. Too many repairs to make indoors.